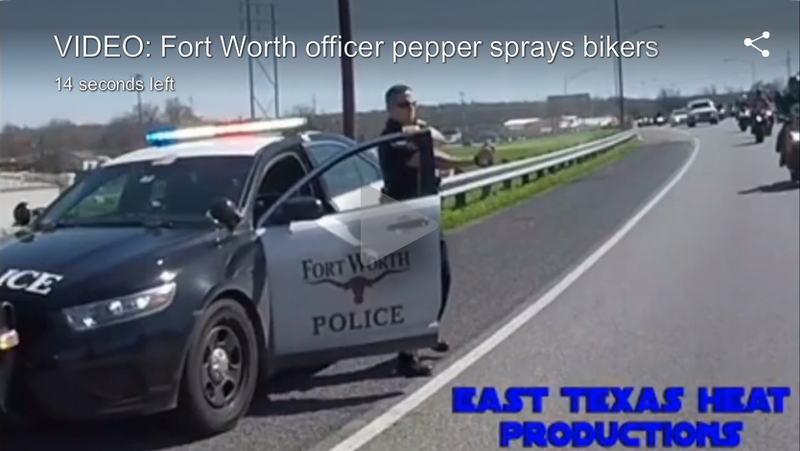 A helmet cam from a rider in Fort Worth, Texas shows what looks to be a police officer, who was parked on the side of the road after pulling a car over, attempting to spray pepper spray into a row of oncoming motorcyclists, for what appears to be no reason. The group of bikes does appear quite large, but it also seems as if there is a decent mix of styles and like everyone is riding fairly responsibly. You can also see the bikes behind the camera shifting to try and avoid the officer’s assault. I can’t imagine what would make the officer think they needed to do something like this, or how every police department in the country doesn’t have a morning “remember, everyone has cameras everywhere” reminder, but this is just ridiculous. The police claim they’re passing along the video to internal affairs for investigation. Thanks for the tip Barbara!